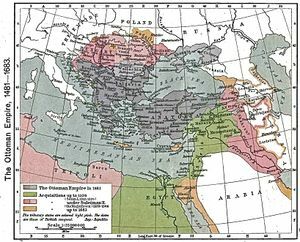 نمو الدولة العثمانية (1453–1683) هي الفترة التي تلت قيام الدولة العثمانية (1299–1453) والتي وصلت فيها الدولة إلى السلام العثماني. وفي تلك الفترة، اتسعت الدولة العثمانية في الاتجاه الجنوب غربيإلى شمال أفريقيا وتعاركت مع الدولة الصفوية الشيعية الفارسية إلى الشرق منها. فترة النمو تلتها ركود الدولة العثمانية (1683–1827). When Bayezid II was enthroned upon his father's death in 1481, he first had to fight his younger brother Cem, who took Inegöl and Bursa and proclaimed himself Sultan of Anatolia. After a battle at Yenişehir, Cem was defeated and fled to Cairo. The very next year he returned, supported by the Mameluks, and took eastern Anatolia, Ankara and Konya but eventually he was beaten and forced to flee to Rhodes. Sultan Bayezid attacked Venice in 1499. Peace was signed in 1503, and the Ottomans gained the last Venetian strongholds on the Peloponnesos and some towns along the Adriatic coast. In the 1500s Mameluks and Persians under Shah Ismail I allied against the Ottomans. The war ended 1511 in favor for the Turks. During his reign, سليم الأول was able to expand the empire's borders greatly to the south and east. He defeated the المماليك and conquered most of modern Syria, لبنان, فلسطين ومصر, including the holy city of Jerusalem as well as القاهرة, the residence of the Abbasid caliph. Thus, Selim was able to proclaim himself caliph of Islam. Selim I conquered the الدولة الصفوية, only to lose it soon after; the Safavids later defeated and conquered the eastern Ottomans, and captured Baghdad. The Empire established a navy in the Red Sea that succeeded, at least for a while, in countering Portuguese influence on the spice trade. During this period, the Empire vied with the emerging European colonial powers, in the Indian Ocean. Fleets, with soldiers and arms, were sent to support Muslim rulers في كنيا وأتشيه (on the northern tip of the island of Sumatra), and to defend the Ottoman spice and slave trades. In Aceh, the Ottomans built a fortress, and supplied it with huge cannon. The Dutch Protestants were at first helped by the Ottomans in their struggle against Catholic Spain. The Ottoman navy also had much influence in the Mediterranean Sea, and trade there flourished, because of the stability afforded to the shipping lanes. At the Battle of Chaldiran in eastern Anatolia in 1514, Ottoman forces under Sultan Selim I won a decisive victory against the Safavids, ensuring Ottoman security on their eastern front. Suleiman the Magnificent first put down a revolt led by the Ottoman-appointed governor in Damascus. By August, 1521, Suleiman had completed the conquest of Serbia capturing the city of Belgrade. In 1522, Suleiman captured Rhodes. On August 29, 1526 Suleiman defeated Louis II of Hungary at the Battle of Mohács, and set up Ottoman rule in Hungary. By 1541, Suleiman controlled most of present-day Hungary, known as the Great Alföld, and installed Zápolya's family as rulers of the independent principality of Transylvania, a vassal state of the Empire. (Walachia and Moldavia also became tributary principalities of the Ottoman Empire.) Holy Roman Emperor Ferdinand I claimed the so-called "Royal Hungary" (present-day Slovakia, North-Western Hungary and western Croatia), a territory which temporarily fixed the border between the Habsburgs and the Ottomans. This map shows the area of the Ottoman Empire at the death of Suleiman the Magnificent, 1566. The Shi'ite Safavid Empire ruled Persia and modern-day Iraq. Suleiman waged three campaigns against the Safavids; in the earliest, the historically important city of Baghdad fell to Suleiman's forces in 1534. The second campaign, 1548–1549, resulted in temporary Ottoman gains in Tabriz and Azerbaijan, a lasting presence in the province of Van, and some forts in Georgia. In his third campaign, in 1555, Suleiman's forces failed to eliminate the Shah's army, which withdrew into the mountains of Luristan, and eventually signed a treaty at Amasya,[محل شك] in which the Shah recognized the existing borders and promised to end his raids into Ottoman territory. Huge territories of North Africa up to west of Algeria were annexed. The Barbary States of Tripolitania, Tunisia and Algeria became autonomous provinces of the Empire. The piracy carried on thereafter by the Barbary pirates of North Africa remained part of the wars against Spain, and the Ottoman expansion was associated with naval dominance for a short period in the Mediterranean Sea. In 1535 the Habsburg Holy Roman Emperor, Charles V (Charles I of Spain) won an important victory against the Ottomans at Tunis, but in 1536 King Francis I of France allied himself with Suleiman against Charles. In 1538, the fleet of Charles V was defeated at the Battle of Preveza by Khair ad Din, securing the eastern Mediterranean for the Turks for 33 years. Francis I asked for help from Suleiman, then sent a fleet headed by Khair ad Din who was victorious over the Spaniards, and managed to retake Naples from them. Suleiman bestowed on him the title of Baylar Bey. One result of the alliance was the fierce sea duel between Dragut and Andrea Doria, which left the northern Mediterranean European and the southern Mediterranean in Ottoman's hands. Thereafter, attention reverted to the west, and Suleiman I, upon ascending the throne in 1518, led a series of campaigns into the Balkans. Under Suleiman, a brilliant strategist, the Ottomans advanced steadily northward, taking Belgrade, the capital of Serbia in 1521, defeating Hungary in 1526, and besieging Vienna in 1529. Mehmed Pasha was one of the Grand Viziers of Suleiman but he gained absolute power after the death of Sulemian. During the reign of Selim II, he became the real ruler of the Ottoman Empire, a situation which lasted until Mehmed Pasha's death in 1579. In the earlier part of his reign Ahmed I showed decision and vigour, which were belied by his subsequent conduct. The wars which attended his accession both in Hungary and in Persia terminated unfavourably for the Empire, and her prestige received its first check in the Treaty of Sitvatorok, signed in 1606, whereby the annual tribute paid by Austria was abolished. Georgia and Azerbaijan was ceded to Persia. عثمان الثاني after securing the Empire's eastern border by signing a peace treaty with Safavid Iran, he personally led the Ottoman invasion of Poland during the Moldavian Magnate Wars. Forced to sign a peace treaty with the Polish after the Battle of Chotin (Chocim) (in fact siege of Chotin by the Polish hetman Jan Chodkiewicz) in September-October, 1621, Osman II returned home to Constantinople in shame, blaming the cowardice of the Janissaries and the insufficiency of his statesmen for his humiliation. مراد الرابع was the Sultan of the Ottoman Empire from 1623 to 1640, known both for restoring the authority of the state and for the brutality of his methods. Murad IV's reign is most notable for a war against Persia in which Ottoman forces conquered أذربيجان, occupied تبريز, Hamadan, and, in the last great feat of Imperial Ottoman arms, captured بغداد in 1638. Murad IV himself commanded the invasion of Mesopotamia and proved to be an outstanding field commander. ^ Finkel, Caroline, Osman's Dream, (Basic Books, 2004), 57;"Istanbul was only adopted as the city's official name in 1930.."